We are still waiting for some of the electronic parts for the robot to come in the mail but we have the trolling motors and hull so we did some testing today. We made a U-shaped frame of wood and painted it red. Then attached this wood frame to the boat with bungee-cords. The motors come with mounting clamps so once there was something for them to clamp onto, mounting one on each side to the wood frame was easy. The battery is inside a water-resistant case with a circuit breaker to minimize risk from a salt-water splash on the battery. When the phone/computer controls this it will steer by adjusting the power sent to the two motors. Putting more power to the left side makes the boat turn to the right and more to the right makes it turn left. This makes for a simple design as there is no rudder to control, it is just turning motors on and off. So we had to try steering this way with humans. 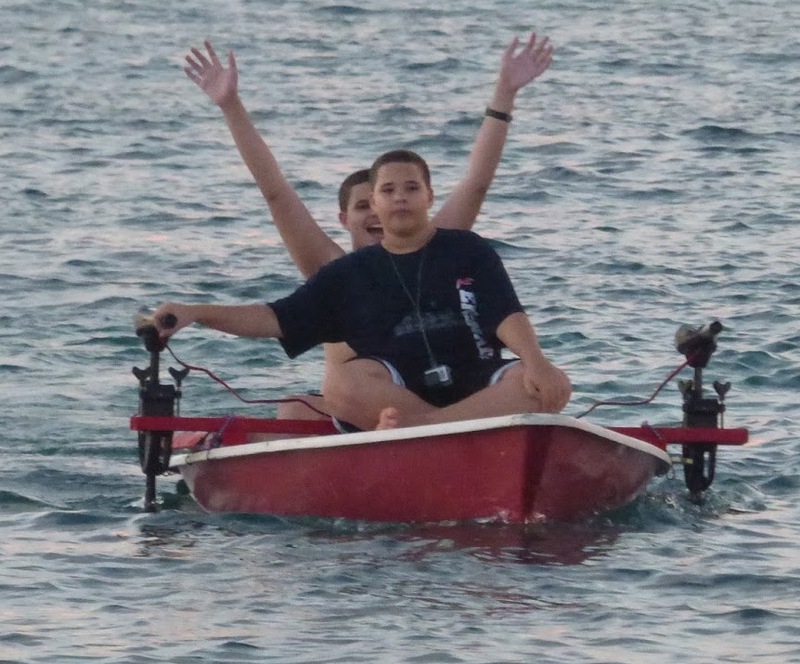 We started out with Teryn facing backward so his feet could be down inside the boat and Dad dragging in the water behind to be able to act as a rudder. 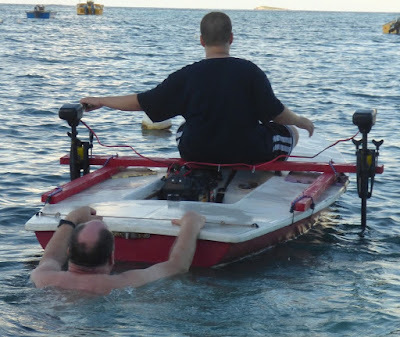 With this Teryn could control the boat fine and I could turn it with my body if he left throttles alone. We later decided having the captain looking forward is better. We also tried Teryn driving without Dad in the water behind and he found it hard to control. I also tried this and also found it hard. We could sort of manage at slow speeds. I suspect with a bit more practice we could get used to it and also that a computer will not have trouble. If you click on a picture you can get a larger version with more detail. The above picture is not in chronological order but it seems the best at showing how everything was. Zoomed in you can see bungee-cords and everything. I think we are calling this 12 foot robot "TowBot". We will use it as a "Tow Boat" and is is also a "Toy Boat" and a "Robot". 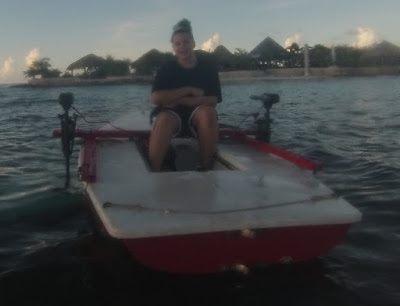 The boat took on a lot of water, probably more than 100 lbs in like 1 hour. It has been in the basement since before I had kids, so more than 14 years. I will look into just filling the inside with foam. At the moment it is not in good enough shape to go to an island 10 miles away, let alone Africa. We chose today for our first test because it was a particularly calm day. The boat is very stable and has lots of power. 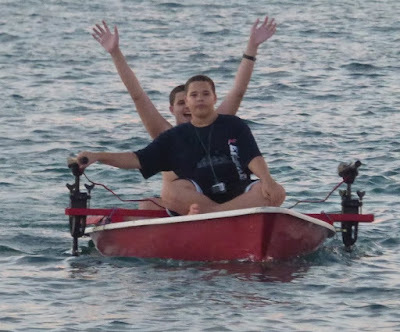 The instructions for the 46 lbs thrust motors say they can push a boat up to 2,000 lbs and our boat is more like 250 without humans and 500 with humans, and we have two motors.